Mary Kent Harrison RBA, NEAC (1915-1983). Mary Kent Harrison (nee Marryat) signed her work Mary Marryat until her marriage to George Kent Harrison after which she signed her work Mary Kent. Mary Kent Harrison studied at Kingston School of Art, the Slade School of Fine Art and the Royal Academy Schools. 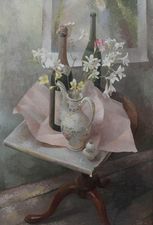 She exhibited at the Royal Academy, New English Art Club and elsewhere. She was a member of the Royal Society of British Artists and the New English Art Club. She lived in Wimbledon and later at Bolton-le-Bowland, Clitheroe, Lancashire.